I don’t know if I’ve ever told you this, but, my husband is rad. Totally rad. I love him dearly. 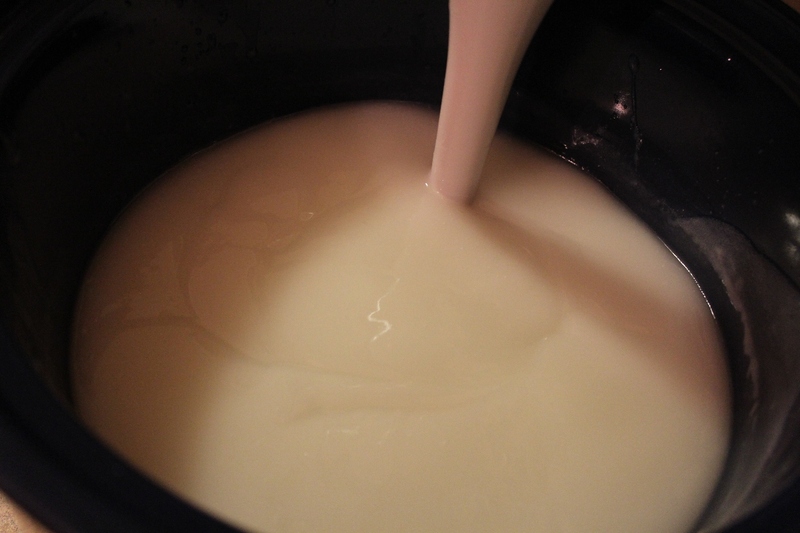 Super-fatting, for those new to soap-making, is adding extra oil to the recipe that is in excess of what the lye can bind to, so that extra oil is not converted. For a more detailed and scientific definition, go here. By super-fatting the coconut oil in this soap, you end up with a dreamy, thick, foamy-lathering soap that has all of the bells and whistles of coconut oil. This recipe is 18% super-fatted and has only 3 simple ingredients. You can’t go wrong! We do the hot process method of soap-making, and for that you really need to have a crock pot and stick blender, along with a few other odds and ends. soap mold – A standard sized bread pan is perfect for this batch, cardboard boxes will also work. We used our wooden (DIY) mold which was a bit too big, so we added cardboard to the ends to make it smaller. 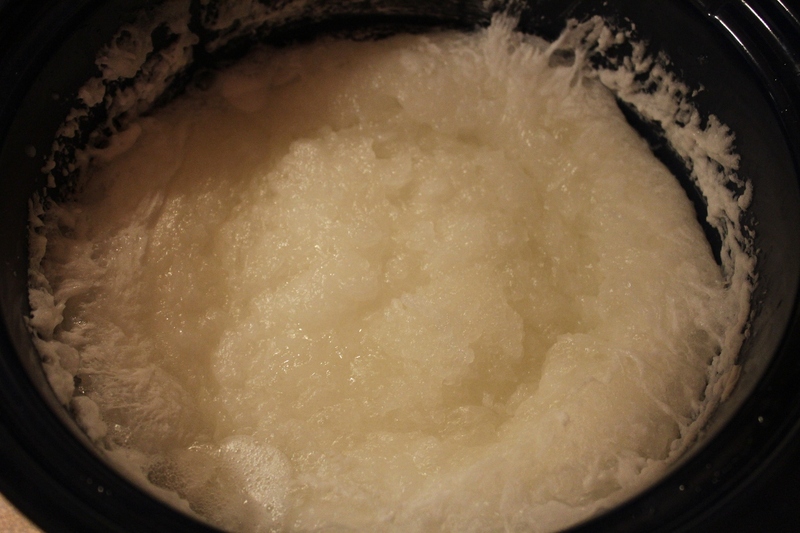 Melt the coconut oil until it is completely liquid and added it to the crockpot on low heat. Measure and pour the water into a glass bowl. Measure and pour the lye into a separate glass bowl or jar. Take both bowls out of doors. Slowly, add the lye to the water. Do not mess this part up! Never add water to lye. That’s when the danger happens. I’m not a scientist, or a genius, but I know how to stay safe when making soap, and you should too, so do a bit of homework beforehand on safety if this is your first soap-rodeo 🙂 It’s not hard, but is very specific, so know the rules beforehand and don’t be clumsy about it. It is important to add the lye to the water out of doors because when the two are mixed there is some noxious off-gassing, and you don’t want to breath it or have the fumes in your dwelling. At first the lye and water will be cloudy, but then will start to clarify. Wait until the water looks clear. Though the mixture looks harmless, it’s not. Don’t spill or splash. The mixture gets very hot, so use caution when handling the glass jar or bowl. Slowly, add the lye/water to the crockpot and slowly stir. Cover and let the soap cook. It will get bubbly and rise a bit. The oil puddles will disappear and the soap will look like a semi-translucent, vaseline-type mixture. Cooking time varies depending on your crock pot. Expect over a half an hour at least. If you are adding essential oils, add them at this point, once the mixture has cooled a bit. Add them when it’s too hot and they will lose their fragrance. Scoop the soap into your parchment paper-lined soap mold, and allow to cool. Cut the soap as soon as it has set up. Coconut oil soap sets up harder than most other soaps and can be difficult to cut (cleanly), so cut it up as early as it is prudent to do so. You can test out a bar right away, but allow the rest to cure 24 hours at the bare minimum. A few weeks is preferable. Enjoy as you would any homemade soap, but this soap in particular is GREAT for felting! **Do you wish to deepen your herbal knowledge? Or, are you just starting out on your herbal journey? Cultivate your knowledge with one of the most respected online herbal academies around, The Herbal Academy of New England. They have courses for beginners and intermediates, host an online Herbarium, and give herbal info freely on their website and blog. Since you understand that vitality grows naturally from the way you live your life, and health doesn’t come from a plastic bottle, you may be interested in investing in it. Check out the herbal courses at HANE, and the many things they offer. We are herbalists, a spirited group of individuals from all walks of life, joined together by our gratitude for nature and our desire to live and heal with plants. Along our herbal journey, we have grown closer to the earth and closer to the fellow beings whom it sustains. We have learned and continue to learn how even the smallest, seemingly insignificant plant has value. Real value — to its ecosystem and to us. This connection that we share, this knowledge that we have gained, and all that we have yet to learn. My favorite HANE resource is the HERBARIUM! The Herbarium is a digital transformation of the traditional herbarium– a collection of dried plants used as reference, to share herbal experiences, discoveries, and lessons through beautiful visuals. HANE has made a digital herbal compendium complete with constantly updated herbal monographs, photographs, thoughtful articles, and educational podcasts, videos, tutorials, and teaching charts. As part of The Herbarium community, you will have all of these resources and more right at your fingertips, enriching your life-long journey through herbalism. Never want to miss a post? Subscribe through the form below. Subscription is a two-step process, so be sure to check your email to activate your subscription. For those of you who already subscribe, thank you for your continued support. I’m honored. Full Disclosure: This post contains affiliate links that provide a small commission to me when purchases are made through that link–-at no extra cost to you. I only affiliate with companies whose products I personally use and can whole-heartedly recommend. Thank you for supporting Sustain, Create and Flow. Precaution: Lye is caustic and dangerous. It is the responsibility of every soap maker to be familiar with how to safely handle such chemicals. Do your homework! Especially if this is your first soap-rodeo. I’ve always wanted to know- in a soap recipe, any soap recipe, can I switch say this recipe and do it as a cold process soap, or would I have to change anything? I haven’t started making soaps yet, and will probably start with hot process just for time’s sake, but wanted to know if I found a recipe I love, can I switch it up and use the same recipe in a cold process? I don’t feel confident answering this, as I have only ever done the hot process. Maybe another reader has the answer? Anybody???? I’m not sure that you can do that. Soapmaking is basically a chemistry experiment and if you change the process, you could have big problems! I’m new to soap making, too. I highly recommend reading a good book on it first so you feel comfortable. I liked Anne L. Watson’s “Smart Soapmaking.” You could get it from the library to check out. Been making cold process soaps for a couple years now — thought I’d take you up on your offer of “jumping in”. The recipe is the same for cold process and hot process, but the technique is different. Generally if you are adding essential oils to hot process, you add them *after* you’ve cooked the soap, but before you mold it. Essential oils tend to have low flash points, so if you add them to hot soap, they can burn off, or even ignite (although that’s *really* hard to do, unless you’re using an open flame.) After your zap test, let the soap cool a bit before you stir in oils, and then put it in the mold. In cold process the essential oils get blended with either the oils *before* the lye, or are added to the emulsified batter before it goes in the mold. Because they come into contact with unreacted lye, some of the oils can morph in a cold process recipe. Experiment, take notes, etc. Cold process soaps can be insulated to force the batter to go through gel phase, or you can try to stop gel by refrigerating it. I do both, depending on what result I want. Last thing — stirring lye in glass jars, even heavy walled mason jars — is not a great idea. Over time, the lye etches the glass creating micro fractures in the glass. Having a jar filled with lye shatter while you’re mixing is not a wonderful experience, although it is memorable! Better off to use HDPE plastic (recycling label 2 or 5 on the bottom of the piece) dedicated to the mixing of lye. Old Tupperware or Rubbermaid pitchers at thrift shops are great for this. Great blog post — happy soaping!! I agree ^^^ I also only make HP because I’m basically impatient, but when I’ve asked my soapy friends they say the same thing, its just a different process. When you use soapcalc or other to figure your recipe, the calc doesn’t know if you are doing HP or CP … All that Samiljans said above, is spot on! I don’t remember what we got from it. At least 12 that were about one inch thick. Nope, you wouldn’t need to switch anything in the recipe. Cold process and hot process are the same recipe wise, just different in curing times. Hot process you could technically use within 24 hours because the lye is effectively cooked out. With cold process you can use it within a week, but it’s always best to wait at least 4 for the water to evaporate out and have a harder bar that lasts much longer. I personally stopped making hot process because cold process you have the ability to be more creative in your designs. Any cold process soap recipe can be used with hot process. I believe it can go the other way as well. Hey there! I have been making soap for a few years now and also consider it a perfect way to spend a Friday night (you know you’re 40 when…)! 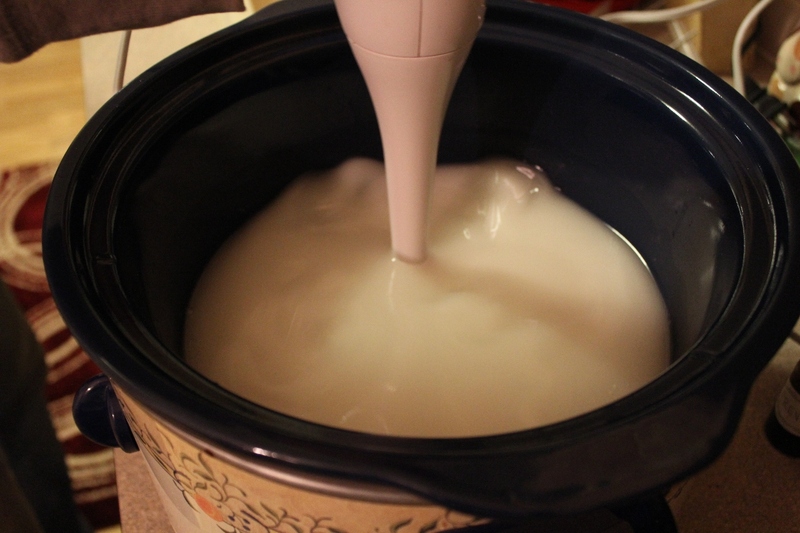 I have never tried the hot process and was wondering….do you need a dedicated crockpot just for soapmaking? Will the lye strip the enamel off of the inside of the crock, or worse yet, make us sick? I’ve seen these recipes many places, but nobody has mentioned this. Thanks! Can’t wait to make this recipe! 2. They don’t like the thought of any trace of the essential oils being left behind on the crock pot. 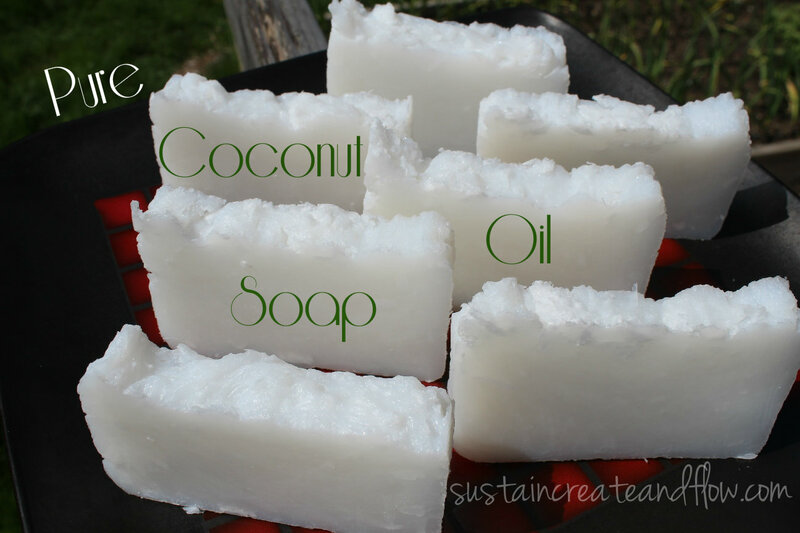 I have done coconut soap like this at 20% superfat and it is amazing. I did it cpop which is the best of both worlds. You get the smoothness of the cp but by putting it in the oven you can use it right away. If you want to use it in homemade laundry soap then just do 0% superfatting. Mine had no scent at all. Hot Process. Very cool Jerica – I would love to try your soap – but not make it myself 😉 I will share this post on my pinterest site! Awesome. I have really been wanting to try soap making! Thanks for linking up at Wildcrafting Wednesday! I get confused with what is weighed on a scale in ounces and what is poured in a measuring cup in ounces! Can you clarify? Is everything weighed on a scale? I am really intrigued by this recipe and would like to try it! Thanks! 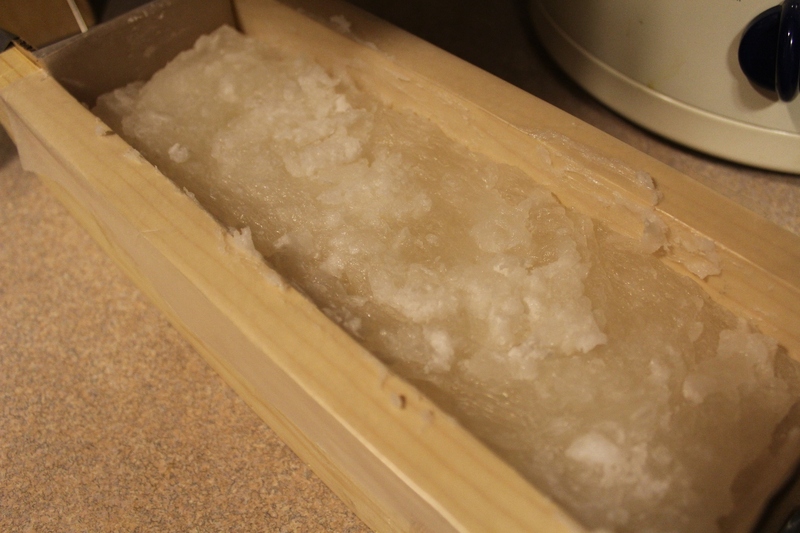 I have always wanted to try making soap, but the process seems so intimidating. This looks like something I can do, though. Where can I buy lye? You can do it!!! You can buy lye at any hardware store. It is sold as a drain cleaner. You might have to ask for it if you are in a high meth-making area. It might be behind the counter. Someday I am going to try to make soap – some day. The lye thing scares me a bit. I love coconut oil and use it sometimes on my skin right out of the jar just after a hot shower. Putting it in soap sounds great! Thanks for the tutorial! very nicely written .. very candid and spontaneous .. this kind of writing has its own charm .. as compared to the usual novelist like pre meditated blabber … hope u enjoyed ur soap .. i’m gonna try making via the cold process .. coconut oil + palm+ castor oil … take care ..
Where do you get the lye? You can usually find 100% lye in hardware stores, near the drain cleaners. Make sure you use 100% lye. Depending on where you live, there are various suppliers for soap supplies. In the USA Essential Depot is a big one and WholeSale Supplies Plus, and in Canada you have New Directions Aromatics and Saffire Blue. Did you set your crockpot on low, medium, high, or warm? In the instructions it says to set the crock pot on low. I have a batch cooking right now…will watch to see if I need to turn up to high? It is good to keep a jug/ bowl full of white vinegar nearby when working with lye. It will neutralize it if you should accidentally get the lye on you. 28 ounces coconut oil, 10 ounces distilled water & 4 ounces of lye. I was ready for failure, and even got disheartened when I say the oil separating in the crock pot but lo and behold. it all came together and it is wonderful! Great news, Tana! I’m so glad it worked out for you 🙂 It’s such a fantastic soap. Hello. I was looking at this recipe and it said it was “Superfatted”. I did not see what other oil you used for “superfatting”? Am I missing something? Usually you use another oil at the end of trace to superfat. I didn’t see that. Please let me know if I am missing something. Thank you! You just use more oil than what the lye can convert. 😉 So in this recipe, there is more coconut oil than what the lye can convert. (I hope I am making sense, my husband is the master soaper in our fam). Thank you for sharing this recipe! This was my first attempt at HP soap making and it was a success. The best part is that my not-quite-two-month-old cooperated and slept most of the day 🙂 You were right about the amount, it made a loaf pan exactly. Could you use fragrance oil instead of essential oils? Hi, I’m having all my gear ready for soap making but still looking for the recipe I feel most comfortable with ( and that I can afford). Can I decrease the amount of coconut oil and substitute it with olive oil? and can I use coconut milk instead of water? I don’t think it would work well. I think this soap is superfatted too much. I’ve not tried it yet, but you could try a small batch and see if you like it? I just finished making a batch of hot process soap. It is 19% coconut oil and 81% lard. It tested as an 8 for PH before it was even done cooking, and has such a silky lather. I was actually really scared to start making soap, but after some research I worked up some courage and ordered the things I needed to make it. I formulated my own recipe, too, which was surprisingly easy to do. If you are wondering of the scent, it is lavender with hints of jasmine (oh, and lavender buds mixed in). me and my girlfriend were trying to make this soap twice with the exact recipe. First time we definitely used a crock pot which was too small and we also didm´t have a digital scale. The second time we used a 5.5l crock pot which is about 6 quarts and a digital scale. However, both times the mixture came all the way up to the top. Did we do anything wrong? The crock pot was set to low. Semmy when you cook soap in the crock pot(i use high setting)it swells up and when it gets high again you just stir it down by folding it over and over and then let it rise again then stir again etc.Im talking with a plastic spoon not a blender.You do this until you think it might be done then testing it as noted above.It will bubble around the edges and you may see clear oil around the edges to but this is normal.Just stir it then let it cook.I usually end up doing this like 8 times.Sometimes you are busy with it for awhile.Don’t leave it unattended it will grow right out of the pot.I think you might have done it right but maybe didn’t stir it or maybe you just thought”this has to be done by now” lol.Try again it really is easy and you will be so proud using and giving away your soap.Hope this helped. I have extra virgin coconut oil at its melting point is 75. Think it will work? Very new to soap making! Made this last night. Had a few mishaps, but I think it turned out all right in the end. Bars are nice and hard but I’m a bit disappointed that the luscious coconut smell seems to have disappeared. I sure hope that when the soap lathers that it comes back! Otherwise, very satisfied with this recipe. Will DEFINITELY be using it again! The smell doesn’t really come back 🙁 I’m glad you liked it though. It’s a spectacular soap! Help – I’ve just made a batch of this soap with a chum and the moment the lye solution was added to the 76 degrees coconut the mixture turned a light tan color. This color remained until the soap was completed. This has not happened to me before. Any idea what went wrong, as we were aiming for the usual pure white soap that results from 100% coconut oil? Thanks! It hasn’t happened to me either, and I’m not pro enough at soap making to say for sure??? Did it harden and lather up ok? How curious… I like Brambleberry and Soap Queen websites. Maybe they can help? The Nerdy Farm Wife is also good at soap making. Yep – hardened up as it should, lathers like a dream, pH fine – just the curious color! Thanks for your reply though. I have read. That different essential oils can sometimes change the color of the soap. I have seen this with other c.p. recipes I have made. The ones I have sold and gifted have always satisfied the lucky receivers. Made this soap from your recipe and so far I really love it. The lather is very nice and the bar is nice and hard. Thanks for sharing!! I don’t have a kitchen scale; do you know the conversion to ounces, and does it have to be a precise measure? Soap really needs to be made with a scale. It’s not very safe to do so otherwise. You can order super cheap ones online. I just bought lye for this recipe and realized that I bought 100% lye crystals? Is this the right thing or should it be liquid? The crystals are correct. They disolve in water. I have some hand soap with coconut oil from Whole Foods. Clogged my drain. I put up a comment way back in September of last year as I didn’t have enough oil for the recipe and mathed it out to have proper proportions. I have another modification that i am in the process of cooking now. I used the full amount of coconut oil and lye but instead of plain water I’ve used Rose water instead. Like I said it’s still cooking but so far there is a faint rose smell to it that seems to be nice and subtle. Doesn’t the coconut oil stop up the pipes? I’ve not heard of that, Ressie. 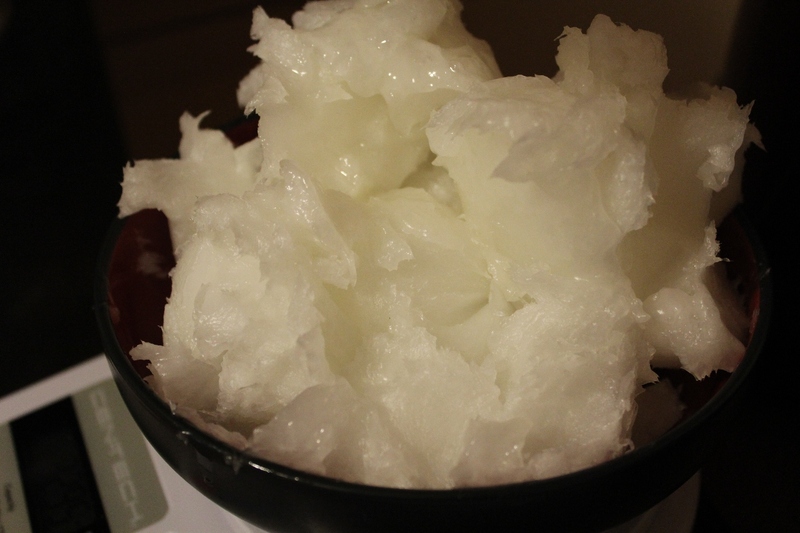 I use tons of coconut oil in various applications. I’ve never had a problem. I’m new to soap making, and am having some trouble. I’ve tried this recipe three times now and no luck. That’s a lot of coconut oil and time that I don’t want to waste again 🙂 So I’m hoping to find out where I went wrong. The first time the soap hardened to a solid block after 35 minutes, I thought I had just misread the measurements so I tried again. The second time (being extra careful and double checking the amounts of everything that went in) I thought it was going fine. It had been cooking for about an hour and the consistency was perfect. Tried the zap test, not only did it zap me but it burned. I let it cook for another 30 minutes checking it often. It started to harden after cooking for a total of an hour an a half and was still zapping me. So I called it quits and went to bed. However I woke more determined to make it work. The third attempt went went much like the second. I finally splashed some vinegar into the crock pot to neutralize the lye and let it set. Knowing nothing but the basics of making soap, should I trash this last batch because of the vinegar? Do you know if it changes the soap? Also, how in the world have I messed this up three times?! With only three ingredients and specific measurements there’s hardly any room for error. However I’ve found a way. Any help or words of wisdom would be appreciated. Sounds like the exact same experience I had with this recipe, Hannah, and I never received any replies to my query. Are your ingredients melted and weighed or weighed solid, cold? The coconut oil was warmed. When you can pour it, it is easier to get it to the right weight. I see where you put the essential oil in during the whole process, is that where I would put in other stuff too such as oatmeal or any herb’s? Hi I apologize if someone already asked this question, I’m at work and I just don’t have enough time to read thru all the comments. Has anyone ever tried this recipe with the addition of a salt water brine? I’ve seen many cold orocess recipes for 100% C oil soap with the salt water but never one with the hot process method abd I’m just itching to try it out. I’m a little like u, I haven’t really worked up the courage to start formulating my own recipes so some advice would be super helpful! Thanks! I really want to make this soap BUT I don’t have scales to measure oz. how can I measure this using, cups, teaspoons, ect? You really need a scale. 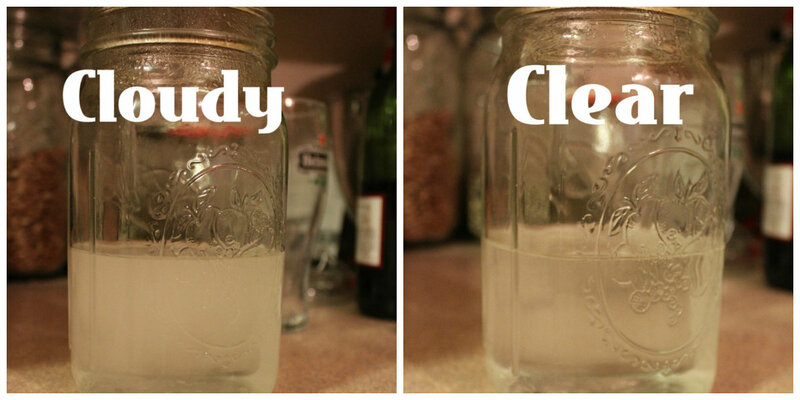 Pingback: DIY Laundry Soap – Words. Thus, Worlds. In your recipe when you measure 33oz of Coconut Oil is it melted or hard coconut oil when you measure? Thank you, I look forward to trying this. Hi! I’m a HP’er and have always wondered about super fatting. You explained it and simply showed it with your recipe. I have been wanting to make this Coconut Soap for the longest time. I’m going to do it today! Thanks so much for sharing.